Happy December, you horror lovin’ freaks! I know Christmastime isn’t always a favorite of horror fans–having slowly given up hope that October would return in a glorious rebirth of pumpkins and candy–but I have something to help ease the transition: an audio book giveaway of my exclusive novella REALITY ENGINEERS! Have you ever wanted the ability to alter the world around you? To have the very nature of existence bend to your whims? Have you ever been to Moon Hill? This great horror novella, set in Anthony J Rapino’s Moon Hill universe is filled with strange manifestations, odd happenings, and not-so-random chance encounters. It’s time for you to visit Moon Hill. If you like the artwork–created by Michelle Harvey–it’s available for purchase. 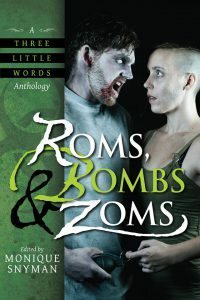 Before we get to the giveaway, I also would like to announce that a new anthology ROMS, BOMBS, AND ZOMS is officially available. I have a story in this anothology that I co-wrote with Monique Snyman, entitled “I’ve Got You Under My Skin.” The ebook is a mere 3.99! Okay, the giveaway. Here’s the thing. Usually these rafflecoptor deals insist that you follow me on Twitter and like me on Facebook, and sign up for my blog, and so on. But let’s be honest. That’s strong-arming. I don’t want to force you to like me. I want you to read some of my free offerings, browse my website, then decide hey, this isn’t so bad! Maybe then you’ll go for a cheap ebook, followed by a slightly higher priced audio book–because you enjoy it! Not because I forced you to buy something or sign up to a newsletter. For this reason, the giveaway doesn’t ask you to submit mind, body, and soul. If you want to like my Facebook page and buy a book, that’s another story entirely. After you enter my contest, be sure to head back to Milo Fowler’s site to enter even more contests!